1970 was a very active year for me. After returning from Nationals at the completion of my college sailing career, I joined the crew of that year’s Bermuda Race winner Carina. After that, it was time to find a job! Paul Coble offered me a position on Heritage‘s shore team and I joined a number of my former college sailing competitors on the crew. Charlie Morgan not only designed, built and skipped Heritage (US-23), he also built the sails! Morgan was the first to install a hydraulic lift in order to dry sail his wooden 12 to minimize water-weight gain. Unfortunately, Heritage suffered from the same malady as Valiant (US-24). The trend was to continue increasing displacement particularly aft, remember the famous bustles? Even Intrepid (US-22), re-designed by Brit Chance had moved in this direction. I was recently asked why I do not have more photos from 1970. Well one day upon Heritage’s return to the dock after racing, I set down my camera to handle her lines and never saw that camera again. –SL. COWES, England, Aug. 19 — Shortly before setting out today in its capacity as the official flagship for the America’s Cup Jubilee, America, the 130-foot replica of the schooner that won the first Cup race in 1851— was hailed by a local sailor passing by on a small sloop. “Look at all the trouble you’ve caused us,” he yelled at the crew. For British sailors, the main trouble with the America’s Cup is that, despite countless challenges in the intervening 150 years, they have failed to win it back. But that did not stop the Royal Yacht Squadron, in conjunction with the New York Yacht Club, from organizing an ambitious Jubilee regatta to commemorate that first race in the same waters in which it was sailed. And in cool, blustery conditions this morning on the Solent, the current-swept waterway that separates mainland England from the Isle of Wight, the racing started for more than 160 boats in 15 divisions. Conspicuous by their absence, however, were the 36 yachts entered in the three marquee 12-Metre classes, and the nine boats scheduled to race in the International America’s Cup Class fleet. With a building breeze that leveled off at a fresh 25 knots with gusts over 30, the conditions were deemed too boisterous for the relatively delicate twelves. As the day unfolded, it appeared that in the case of the 12-Metres, discretion may well have triumphed over valor. 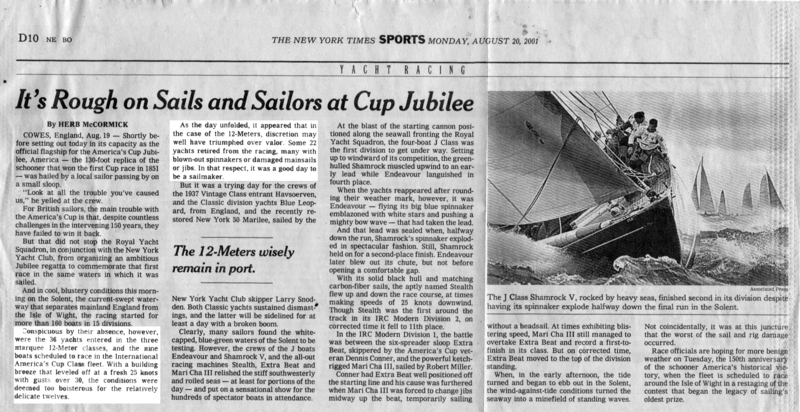 Some 22 yachts retired from the racing, many with blown-out spinnakers or damaged mainsails or jibs. In that respect, it was a good day to be a sailmaker. But it was a trying day for crews of the 1937 Vintage Class entrant Havsoerven and the Classic division yachts Blue Leopard, from England and the recently restored New York 50, Marilee, sailed by the New York Yacht Club skipper Larry Snoden. Both Classic yachts sustained dismasting, and the latter will be sidelined for at least a day with a broken boom. The 12-Metres wisely remain in port. Clearly, many sailors found the white-capped, blue-green waters of the Solent to be testing. However, the crews of the J boats Endeavour and Shamrock V, and the all-out racing machines Stealth, Extra Beat and Mari Cha III relished the stiff southwesterly and roiled seas— at least for portions of the day— and put on a sensational show for the hundreds of spectator boats in attendance. At the blast of the starting cannon positioned along the seawall fronting the Royal Yacht Squadron, the four-boat J Class was the first division to get under way. Setting up to windward of its competition, the green-hulled Shamrock muscled upwind to an early lead while Endeavour languished in fourth place. When the yachts reappeared after rounding their weather mark, however, it was Endeavour— flying its big blue spinnaker emblazoned with white stars and pushing a mighty bow wave— that had taken the lead. And that lead was sealed when, halfway down the run, Shamrock’s spinnaker exploded in spectacular fashion. Still, Shamrock held on for a second-place finish. Endeavour later blew out its chute, but not before opening a comfortable gap. With its solid black hull and matching carbon-fiber sails, the aptly named Stealth flew up and down the race course, at times making speeds of 25 knots downwind. Though Stealth was the first around the track in its IRC Modern Division 2, on corrected time it fell to 11th place. In the IRC Modern Division 1, the battle was between the six-spreader sloop Extra Beat, skippered by the America’s Cup veteran Dennis Conner, and the powerful ketch-rigged Mari Cha III, sailed by Robert Miller. Conner had Extra Beat well positioned off the starting line and his cause was furthered when Mari Cha III was forced to change jibs midway up the beat, temporarily sailing without a headsail. At times exhibiting blistering speed, Mari Cha III still managed to overtake Extra Beat and record a first-to-finish in its class. But on corrected time, Extra Beat moved to the top of the division standing. When, in the early afternoon, the tide turned and began to ebb out in the Solent, the wind-against-tide conditions turned the seaway into a minefield of standing waves. Not coincidentally, it was at this juncture that the worst of the sail and rig damage occurred. Race officials are hoping for more benign weather on Tuesday, the 150th anniversary of the schooner America’s historical victory, when the fleet is scheduled to race around the Isle of Wight in a restaging of the contest that began the legacy of sailing’s oldest prize. Clipper (US-32) was built at Newport Offshore in 1979, a David Pedrick design built on the foundation of the keel and keel apron of Independence. I believe this was the first time parts were re-purposed in the 12 metre class. Subsequently the concept would be utilized by the America II group to interchange parts as part of a 2 boat testing program. Which takes into account such factors as length (L), skin girth and chain girth (d), sail area and freeboard. It might just as well be expressed: money, plus genius, plus craftsmanship, multiplied by X (which includes desire for fame, love of the sea, patriotism, competitiveness, etc.). The money and the X-factor are where the yacht begins, as you can see in Walter Gubelmann’s pink-walled office on the 19th floor of the Seagram Building, the Twelve-Meter of Park Avenue towers. Over the couch there is a painting of Windigo, Gubelmann’s crack 70-foot ocean-racing yawl. On a side table rests a leather-bound volume of clippings concerning Seven Seas, the three masted, square-rigged ship that belonged to Gubelmann pere (inventor of adding and subtracting machines), and on which with 27 crew, Walter Gubelmann as a young man raced young Huntington Hartford’s Joseph Conrad, the only other privately-owned square rigger at hand. Next year there may well be a scrapbook and a portrait of Constellation, a new “Twelve” designed as a candidate to defend the America’s Cup against the British this fall. “Constellation is only the working name, mind you,” says Gubelmann, with the air of a man constantly balanced between reservation and decision. “We can change it at any time up the launching.” Constellation was also the name of the United States frigate, nicknamed “The Yankee Racehorse,” which the British blockading fleet kept bottled up in Hampton Roads through the entire War of 1812, but for all that, it isn’t a bad name for a syndicate-owned craft that will cost roughly $500,000 to design, build, equip and campaign for one sailing season on Long Island and Block Island Sounds. I’ve been thinking about the America’s Cup since 1957, without doing anything about it,” Gubelmann said recently. “Then last summer there seemed to be a great lethargy over here in the face of what appeared to be a very serious British challenge. They haven’t won back the Cup in nearly a century of trying, but for 1964, they are trying harder than ever. And we were resting on our laurels after the workout the Australians gave us in ’62. My crew on Windigo talks about it. The New York Yacht Club is in charge of the Cup and its defense, and when I talked to the people there, they said: “Go ahead, the more contending boats we have the better.” So I went to Delphi, that is to Harold Vanderbilt. He twice defended the Cup successfully — once with an inferior boat— against the British the 1930s. Mr. Vanderbilt said he would take a share if I formed a syndicate. That did it— I felt pretty good. “Well they say you need $500,000 and we’ve now got a little more than that— call it a safety margin. I have friends in Philadelphia, people we sail with in Main in summer. I have friends in Palm Beach, where I’ve lived half of my life. I’m afraid I have friends who are also Pierre du Pont’s friends, but he denied to build a new Twelve a littler later than we did, and I got to them before he did. All told, 25 people put up roughly $25,000 each. Eric Ridder, publisher of “The Journal of Commerce” and a great pal of mine in Oyster Bay, took a share. So did his father, and his brother. “Some people gave me a check for the whole amount— one said he never bought anything on the installment system, and wouldn’t start now— but others are paying over six or eight months. Of course, there were those who said they’d take a share then after talking with their financial advisers, found they couldn’t. It’s not tax-deductible. Gubelmann is syndicate manager and originally had himself slotted as the Constellation’s navigation. “I’m out for the job,” he had said, “but if I start making mistakes or if someone better turns up, I’m through. That goes for everyone on the boat.” Gubelmann meant what he said. Two weeks ago, he relieved himself of his navigator’s berth in favor of K. Dunn Gifford. There remains, for Gubelmann, more than enough to do. The pre-war Twelve Nereus has been chartered as Constellation’s sparring partner, and Briggs Cunningham’s powerboat Chaperone will act as tender to the engine-less yachts. The Castle Hill Hotel, overlooking the entrance to Newport’s harbor, has been rented for a campaign base. Among other details to arrange was a $1,000,000 / $2,000,000 insurance policy to cover any boat used and a $1,000,000 / $3,000,000 umbrella policy to cover everything else, from a car a crew member may borrow, to slander. About the design Gubelmann had no worry. There are fewer than a dozen naval architects in America with the experience and skill to take the Twelve-Meter formula and produce a successful Twelve-Meter yacht. Philip Rhodes, designed Weatherly, the last champion, and A.E. (Bill) Luders, who is designing the new du Pont boat, Aurora, worked on Weatherly’s modifications. Ray Hunt designed Easterner, which has never been raced steadily enough to show whether her occasional flashes of brilliance could, in other hands, be made more than occasional. Olin Stephens once wanted to be a good painter, and studied under Heliker and Kuniyoshi. But he lacks the conventional “artistic” appearance. With brown suit, bow tie, glasses, a quiet, efficient manner, he might be a foreign service career officer, or a scholar of the medieval history he enjoys reading. Running the world’s largest yacht design firm ties him down to his office on lower Madison Ave. most of the time. What leisure he has is spent on his farm in Sheffield, Mass. And he doesn’t own a boat. But Stephens regards any view of himself as disinterested in boats as either exaggerated or somewhat out of date. “There was a time, during the war, after it, and through the Korean affair when we did a lot of Navy work. I was busy running the office, keeping men employed, doing stacks of paperwork and I didn’t have much time for yacht design. But then all that slacked off, and the America’s Cup matches were revived. The commission to design Columbia party my interest again. When Mr. Gubelmann asked me if I would design a new Twelve, naturally, I said yes.” Stephens is not the man to point out that he is ta most logical choice to design a boat for a new America’s Cup defense, and that on that assumption he ad already been doodling with and pondering the design. Once commissioned, he spent three involved months with “the tank.” Stephens was the first yacht designer to tank-test hull models. He helped Dr. Kenneth Davidson develop the research facilities at Stevens Institute of Technology in Hoboken, which are the best in the world, and indeed his identification with the place and the similarity of the names is such that foreign journals occasionally describe his boats as designed by the Stephens Institute. There, six-foot-long models costing $1200 each are put through various tests to determine resistance, lateral force, and leeway angle. The trials are also a test of accuracy; before the 1958 series, the Davidson lab found that dust collecting on models overnight could cause a one percent error in model resistance. For this series David Boyd, the British designer has also used the Hoboken tank, so the advantage has not been all Olin Stephens’s. The best of Stephen’s series of models provided the hull lines for Constellation and with that conclusion the first and biggest of his headaches was over. The construction has to be supervised. Rig, sails and gear arrangements have to be made. But a Twelve-Metre’s function is entirely speed— to comply with the rule and win races— and the designer doesn’t have to make the compromises instead upon by cruising boat owners. He doesn’t have to worry about— though he probably will— the time to come when Constellation will be out of his hands and in those of a human, fallible crew. 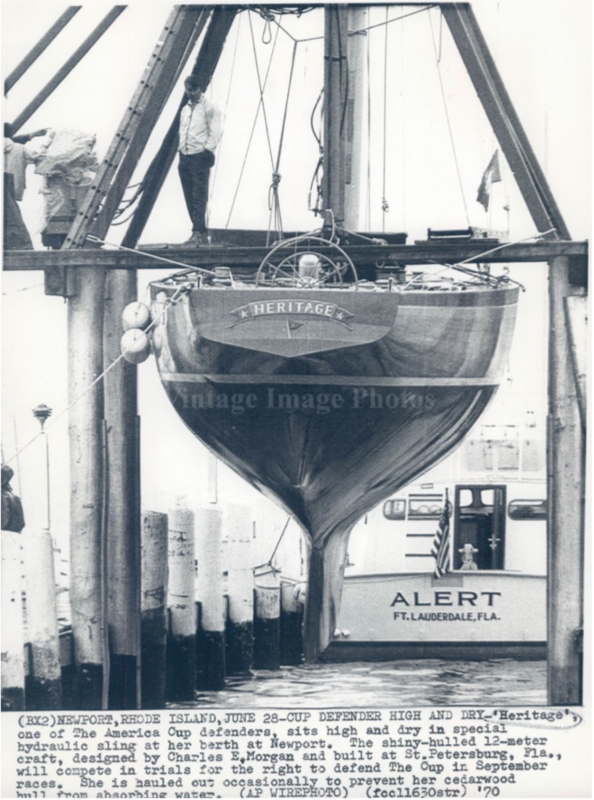 Crew— brilliant on Weatherly, middling on Columbia— was a big reason why a Stephens boat did not defend the Cup in 1962. There is always a chance that his boat may have the edge inherent ability, and the helmsman of the opposing craft emerge as a Vanderbilt or a Mosbacher. These anxieties, at any rate, are premature. 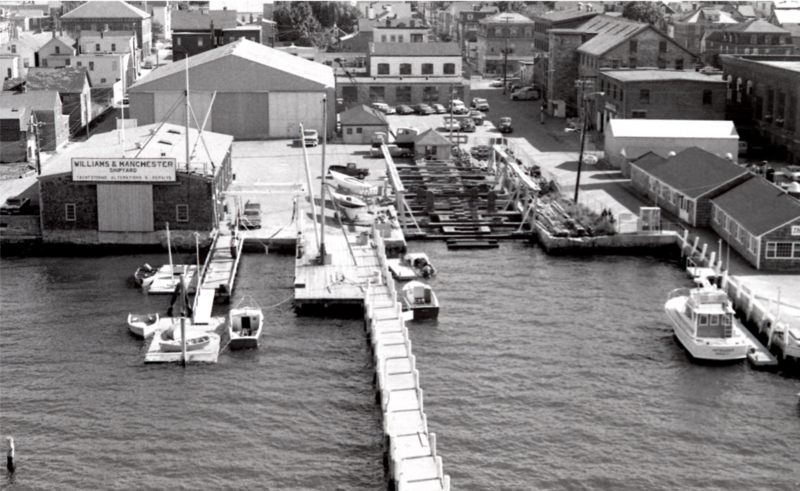 They concern the late summer days in the Brenton Reef swell of Newport, and not the winter mornings, twice a week when Olin Stephens and his brother Rod, the firm’s field engineer, drive out to City Island to call in at Minneford’s the yard where Constellation is building. Minneford’s has in addition to its own men many of the skilled craftsmen who built Columbia at the now shut-down Nevins yard next door. Paul Coble, who was Stephen’s man-on-the-spot at Nevins in 1958 is assistant superintendent at Minneford’s. Nils Halvorsen who lofted Columbia, is doing the same for Constellation. He is a small, elderly Norwegian, springy and close-grained, a man who has spent a long life in company with good wood. A few weeks ago Constellation was still on the loft floor at Minneford’s. There are huge sheets of plywood, covered with a maze of black crayoned curves and diagonals and, as Nils Halvorsen points them out with a batten, they begin to form three views the craft: to one side the sections, as seen from down and stern, a wine-glass with no base; the rest, nearly 70 feet long, the profile and plan view superimposed, which can be disentangled to look something like a boat or a bullet. These are Constellation’s lines, life-size, as drawn by Nils Halvorsen from the architect’s 3/4-inch-to-the-foot scale plans. It is a job for a craftsman, because no matter how accurate the designer is when he draws the yacht on a drawing table, there are bound to be places in the scale of 70 feet where one dimension will not coincide with another— where, if the boat were built that way, a rib might be too narrow by several inches or planking might be forced to take an “unfair” curve. And when he finds these gaps of an inch or two between one plane and another, points to where section and plan do not quite intersect, Nils Halvorsen either “fairs in” the curve between them, using his own judgement, or if it strikes him as an especially crucial spot, he calls up Olin Stephens. When Stephens talks about “breakthroughs” he is thinking in terms of changes of a fraction of an inch here and there. Fractions here and there are the difference between a winner and a loser. Bill Luders and David Boyd, the British designer, might be able to look at those lines and see in which direction Stephens has gone, and they would probably like to; but for most it is guesswork, with guesses based, perhaps, on Gretel’s down-wind ability and Weatherly’s stiffness— has Constellation a little more flare in the topsides than Columbia? Is there a triple more flatness in her run aft? Once in a while, there is a reminder that you shouldn’t take it too seriously. Yachting is a sport. Boats are boats, though this is very much an ultimate boat, designed to furnish not only the maximum of completion to any challenger, but the most response to wind and sea as well. Quite possibly a form of masterpiece, a work of art. To that suggestion Olin Stephens returns a shrug and a laugh. “I don’t know. It’s just a question of doing your best.” Together with Paul Coble, Nils Halvorsen, and Walter Gubelmann, he hopes that his best is good enough to defend the Old Mug against the British Twelve, and that Constellation, if she is chosen, won’t be the first in the long history of the match to let the side down. Victory ’83 (K-22) and Courageous (US-26) cross gybes at the 2016 12mR North American Championship. Fast forward 30 years. Roseanne and I were off for a week of cruising and en route from Nantucket to Edgartown (MA). As we rounded the northern tip of Chappaquiddick Island, we spotted a number of large boats racing around the buoys. Closer inspection revealed they were 12mRs. We watched the racing for a few minutes and then headed into the harbor. Later, we watched them raft up at the Edgartown Yacht Club. It was an impressive sight! In the morning, we decided that a closer look was in order. Uh oh…..the flame that was started in the ‘70’s was starting to burn a little brighter. Perhaps we should buy a 12mR? We started talking with Jim Gretzky about 12mRs. Roseanne and I had seen Defender (US-33) many times as we drove past Cracker Boy Marina in Riviera Beach where she had been sitting on the hard for many years. Jim had been the project designer for the boat when she was built back in ’82, so she quickly moved to the top of the list. We looked at the boat, met the owner and tried hard to make a deal, but to no avail. That was the end of the Defender story…. for then. Stay tuned, she makes another appearance later in this story. Jim activated his 12mR network and another great boat popped up…Victory 83 (K-22). She had been in a boatyard in Cogolin, France for several years. Roseanne, Jim and I packed our bags and headed to France to take a look. We asked Ian Howlett, Victory’s designer to meet us there. We found Victory in the back of the yard, under a tree, filled with leaves, rudder and tab frozen hard to port and not looking very attractive. Ian felt she was sound and pronounced her to be “shockingly original!” After some very lengthy negotiations with the Italian owner, we made a deal. Getting the boat out of France turned out to be a bigger adventure than we expected. The Italian owner had “hidden” Victory 83 in France and had not paid taxes. Victory ’83, 2016 12mR North American Champion. She had never been registered, so documentation with the USCG was an issue, etc, etc, etc. There are enough stories to fill 3 articles, but in the end we prevailed. We sold the spars to Doug Peterson for use in Gretel (KA-1) and the winches to the Italians so they could turn Azzurra (I-4) into a museum piece. Next we cut off the rudder because we could not free it up and did not want to go in circles. Finally, we put her on a freighter that was diverted due to a major storm, and eventually saw her again in Newport in November, 2007. Victory 83’s total refit began with a new cockpit and new everything else. This was done under Jim’s leadership with innovative ideas coming from many different people. In September 2008, we decided to race in the North American Championship even though the work wasn’t 100% complete. We wanted to get a measure of how competitive she was after all the work. We were very pleased with our performance in this first regatta. Since then, the Victory 83 team has done quite well with this fully modernized boat. Defender racing at 2017 12mR North American Championship. It was clear to me that Defender was either going to sink or get cut up and sold for scrap. Since there are so few of these great boats, Roseanne and I decided we needed to rescue Defender. I called her back and we made a deal. The first step was to have her hauled and shipped back to Newport. We pumped out the water on the tow to Cracker Boy. (We also got rid of the seagull!) When she was hauled, 2 years of marine growth appeared. That’s when I decided to go to lunch and let them deal with the mess. Two hours later, there was a big pile of barnacles, oysters and other unidentified things under the boat. Defender was shipped to Newport and the slow process of repair and updating began. We did confirm my worry that she was not far from sinking. After the 2016 season, we made the difficult decision to leave Victory 83 in the shed and sail Defender in 2017. In the meantime, we had also picked up USA (US-61) to give us a few bits and pieces we needed to finish Defender. Prior to the first regatta, the crew had only sailed on the boat for an hour or two. They all thought I had gone mad and were debating which insane asylum would be best for me. After the regatta, they couldn’t wait for the next one and had lots of ideas on how to improve the boat. The season has been fun for everyone as we started the revitalization of a boat that hadn’t sailed let alone raced in 23 years! Initially, we had old re-cut sails from Victory and USA. For the North American Championship, we had a new main and 3 new head-sails. We also installed a new rudder, moved the wheels forward and the runners aft to create a more typical layout. The most important outcome from this last regatta is that we convinced ourselves that with these changes and additions, Defender is as competitive as Victory 83. The rescue mission started in 2010 has proven worthwhile. Dennis Williams at the helm of Defender, 2017. As I have said many times to many people, we are the caretakers of these great boats. Our obligation is to leave them better than we found them. We are looking for a buyer for either Victory 83 or Defender to continue building the Modern Division. Victory 83 is a fully modernized, proven winner. Just add water! Defender still needs a little more work to bring her to that same level of modernization and to optimize her competitiveness. We are also hopeful that the Grand Prix fleet will start to grow like the Moderns and that USA will be part of that effort. I am confident new owners will have the same passion as the current owners and that the 12 metre era of the America’s Cup history will continue to prosper. – DW. Halsey Herreshoff (center) hosted Dennis Conner (not pictured) and his Stars & Stripes 87 team at the Herreshoff Marine Museum / America’s Cup Hall of Fame in Bristol, RI on February 4, 2017 where they gathered to commemorate the 30th anniversary of their America’s Cup win. Stars & Stripes 87 was the last of the four 12s named Stars & Stripes, she was a refinement of her earlier namesakes. She was chosen for the Challenger Trials in Fremantle, Australia and won the Louis Vuitton Cup by a score of 4-1 over New Zealand (KZ-7). She went on to win the 26th Match for the America’s Cup by a score of 4-0 on Kookaburra III (KA-15).